← Patience is a virtue, especially for gardeners! As April comes to an end I cannot believe I am writing this post sitting in front of the fire. I should be digging (pardon the pun!) out my shorts and SPF15! However, that happened in March and then they were swiftly put away again. The weather has gone crazy. Three consecutive days of record breaking weather in March lulled us all into a false sense of security. April followed with double the amount of average rainfall and way below average temperatures. Not good news for my plants. After a false start, I have lots of flower seedlings which I am starting to harden off. So far I have sweet peas, livingstone daisies, cosmos, rudbeckia, coreopsis, gazania, silver dust, marigolds, snap dragons, morning glory, aster, Iceland poppies, ladybird poppies, petunia, diascia, gaillardia, sanvitalia, black eyed susan and zinnias. On the veg front the early peas and carrots are coming along, as are the first early potatoes and leeks. The first lettuce leaves should be ready to eat in a couple of weeks and the pak choi won’t be far behind. Outside I have managed to plant some more peas and some beetroot and parsnips. 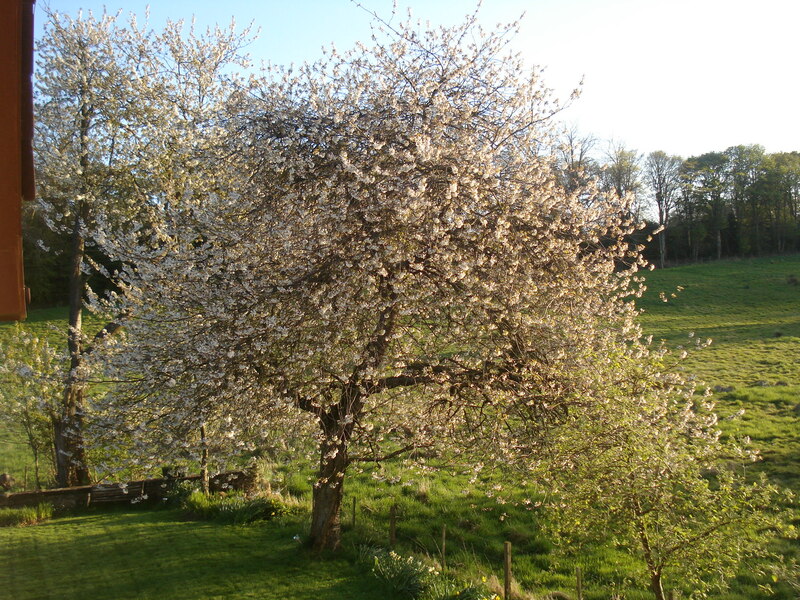 The blossom on the cherry trees was amazing, the aubretia plugs I bought last year are still flowering, as are the hellebores, the acquilegia grown from seed last year is about to flower and the oriental poppies are about to come out. So despite no tulips there is still a lot of colour in the garden. The cold, wet weather has really affected the fruit and veg seedlings. The 2 melon plants and 4 okra plants don’t seem to have grown at all this month and despite putting 2 of the courgette plants into growbags they seem to be rotting at the roots. The aubergine, chilli and tomato plants all look healthy enough but don’t seem to be getting any bigger and some of the brassicas have keeled over from the root. This is either due to over or under watering during the really hot spell in March or a condition called “damping-off”. some of the brassicas have just keeled over! I also managed to kill my sweet basil and lemon basil last week when I split it up into individual pots. I thought I was being clever by separating the individual plants but what I should have done is just separate it in clumps and put them in larger pots. I have started again! Despite the appalling weather we actually got quite a lot done outside. Phase II of the path network is complete, one veggie patch prepared and put into use, the second veggie patch should be ready shortly, some shrubs were relocated, summer bulbs and tubers planted, millions of pots, trays and modules washed with water and bleach and the raspberry canes covered with nets. And, of course, weeding, weeding and then some more weeding! Even if tender plants are kept in the greenhouse, if a cold night is forecast, don’t water them all at 7pm. I did this, the temperature plummeted to -4 degrees and the water froze and killed the plants. When potting on basil, separate seedlings in clumps, NOT by individual plants. They will just die and you will have to start again. 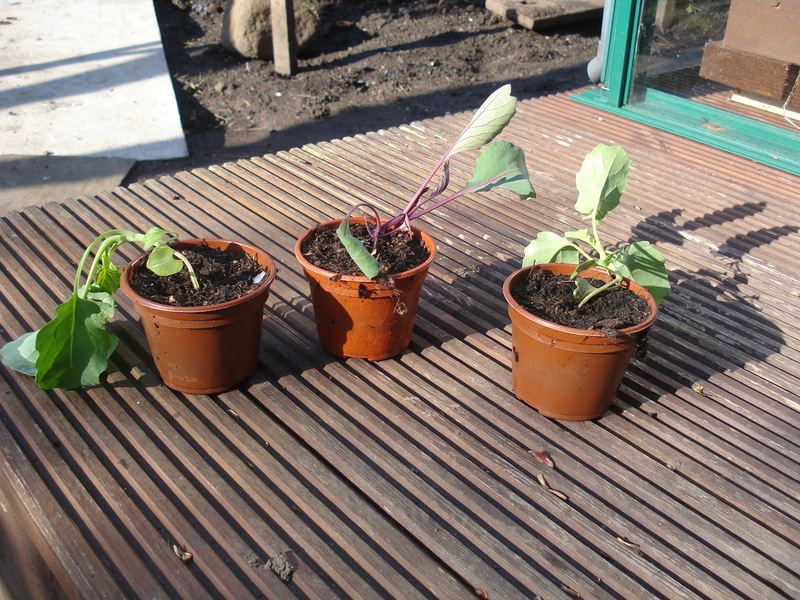 Alternatively, just sow a few seeds in the pot they will stay in so they don’t have to be disturbed at all. Put a marker in the ground where you plant bulbs and tubers so you know where they are. Be prepared for heartbreak! If a pheasant decides it is going to eat all of your chard, tulips and raspberry canes there is very little you can do to stop it. If, like me, to save space you sow 2 different types of seeds in the one seed tray, check the estimated germination time for each seed is roughly the same. Don’t do what I did and sow cosmos seeds beside verbena seeds. Estimated germination time for cosmos is 7-14 days. Estimated germination time for verbena…..2-3 MONTHS! A cup of tea and sticky bun at 3pm and a pint of cider with lots of ice at 6pm keeps Mr Mac happy while he digs. This entry was posted in General and tagged flower seedlings, plants. Bookmark the permalink.